Come to our car wash shop in Campbelltown to get your vehicle carefully hand washed by experts. We offer affordable car wash packages to suit every need. Our team handles all types of cars, company services vehicles and private sedans, vans, and more. Our car wash is centrally located, with customers coming from all over Sydney. Our car wash is located close to the Mittagong area including suburbs Narellan, Bowral, and Gregory Hills. Visit Splash N Shine Car Wash in Campbelltown to experience our premium hand car wash services! How much is a car wash? Choose from our Car Wash Plans below. For car wash add-ons, see our full list of services here. What makes a car wash done by hand so much better than one done by a machine? Technology is great, but there are many tasks done by hand that produce better results. One such example is a car wash service. No automatic car wash can reach the level of cleanliness and quality that a hand car wash can attain. The answer to that question is very simple—precision. A car wash machine simply throws a lot of foam and then throws a lot of water at your vehicle at high speed. This water, combined with the foam, displaces any dirt that was on your vehicle. This may seem like it gets the job done, but it really doesn’t. An automatic car wash will get most of the surface dirt on your car. It will not be able to clean any dirt that is below a cover or that is stuck at an awkward angle. This problem does not exist at all in hand car washes. 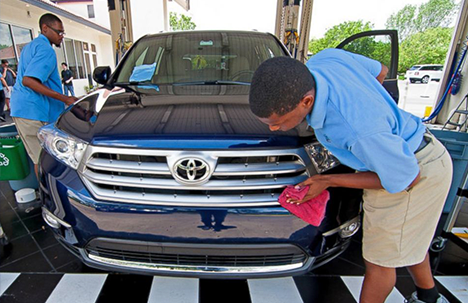 A car wash done by hand means that a person is manually cleaning your car, making sure that it is completely clean. They are able to get into all the corners, all the little openings, and below any coverings, and get all the dirt out. There is no replacement for this type of handiwork yet. We are sure that there will be robots in a decade or two that are able to closely go over the whole car, removing the dirt from each and every part of the car, but they aren’t available now. Thus, this is one area where people are still much better at the job than machines. A car that is washed by hand looks much cleaner and shinier than a car washed by machines. You won’t see supercars or vintage cars being cleaned with harsh high speed water. That’s because the owners of these vehicles care about their vehicles, and want to make sure their beauty lasts as long as possible. With hand car washes, premium quality can be delivered. The experts who clean your car by hand can give it a level of care that is otherwise impossible. You notice these things the first time you go for a hand car wash. You will realise that they have cleaned areas in your vehicle which have never been cleaned before. Another reason that hand car washes can be so beneficial for your vehicle is that your whole car will be inspected by people while it is being cleaned. This means that if there are any problems developing in your vehicle, you will be notified about them. For example, if your car’s light is coming loose and you take it to an automatic car wash, the high pressure of the water used will probably make the light fall off, resulting in you needing to get a new one. On the other hand, when you go for a hand car wash, the cleaner will see that the light is loose and notify you. You can then simply have it tightened and fix the problem. The same happens with scratches and dents – you may not have noticed them, but the person carefully cleaning your car definitely will. These are just some of the reasons that hand car washes are superior to normal car washes. If you are in a hurry, then sure, take your car to an automatic car wash and have it quickly dealt with. However, if you have the time, give your vehicle the care that it deserves and have it hand washed. Give Splash N Shine a call today on (02) 4620 6238.